University Hospitals’ accredited Dietetic Internship Program, founded in 1933 and the second oldest program in the nation, is recognized for providing graduates with a solid background in the field. Upon completing the program, graduates will be effectively prepared to pursue positions as entry-level registered dietitian nutritionists (RDNs). In addition, the UH Dietetic Internship Program has a strong focus on providing each student with the foundation of research processes and applications. In 1965, the dietetic internship linked with the Department of Nutrition at Case Western Reserve University and the Louis Stokes Cleveland Department of Veterans Affairs Medical Center as part of the Combined Dietetic Internship/Master’s Degree Program. Graduates of the program will be adequately prepared to pursue positions as entry level Registered Dietitian Nutritionists. They will be able to begin a professional practice with a solid background encompassing the breadth of the field of dietetics. Their depth of knowledge will allow them to provide quality of service, effectively apply knowledge and provide a continuous systemic approach to evaluating outcomes. The graduate will be able to base their practice on significant scientific principles and best evidence. After graduation, our registered dietitian nutritionists can begin practice with a solid background encompassing the breadth of the field of dietetics. Their depth of knowledge will allow them to provide quality of service, effectively apply knowledge and provide a continuous systemic approach to evaluating outcomes. The graduate will be able to base their practice on significant scientific principles and best evidence. The UH Dietetic Internship Program focuses on research processes and applications. The strong research environment provides students with many opportunities to expand and apply their research knowledge. This process begins during the fall semester when each student is paired with a research mentor in their coursework at Case Western Reserve University. The student and mentor continue to work together throughout the spring semester to complete the competencies/learning outcomes for the concentration. The Combined Dietetic Internship/Master’s Degree Program is 16 months. The first 11 months are devoted to completing the accredited Dietetic Internship Program and 14 hours of graduate school coursework. The remaining graduate school requirements are completed during the final months. This is a winning combination to have a Master’s Degree and registered dietitian nutritionist credentials at the end of the 16-month program and provides the student with a competitive edge when entering the job market for the first time. The Dietetic Internship at University Hospitals provides a minimum of 1,587 hours of full-time scheduled supervised practice experience within a 49-week period. The program has an annual enrollment of five full-time interns. 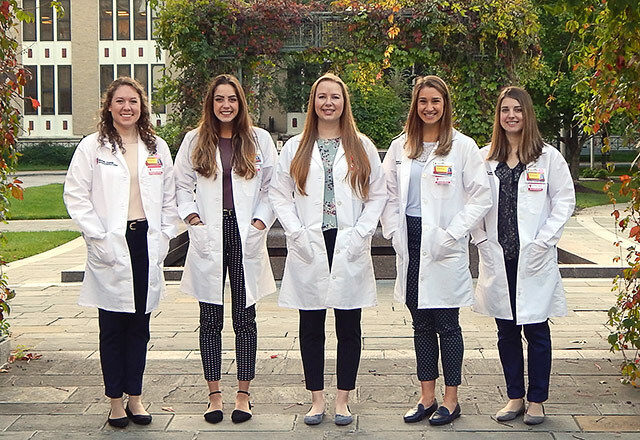 The University Hospitals Cleveland Medical Center Dietetic Internship (DI) Program is accredited by the Accreditation Council for Education in Nutrition and Dietetics (ACEND) of the Academy of Nutrition and Dietetics (AND), 120 South Riverside Plaza, Suite 2190, Chicago, IL 60606-6995, 312-899-0040 ext. 5400. Join us on Friday, January 4, 2019 from 10:00-11:30AM for our Open House event to learn more about UH Cleveland Medical Center and our Dietetic Internship Program.